Good things may come in threes but great things come in twos! Mario and Lugi. Mike and Jack and even Nintendo and Switch! 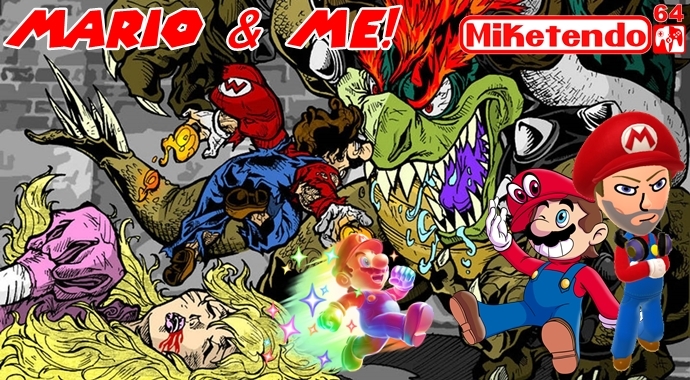 So despite the fact we’ve already shoved one Mario & Me down your throat today, we’re back to do it again! Q2. First Mario game you played? Super Mario Bros..
Q3. Last Mario game you played? Paper Mario Color Splash. Q4. Favourite Power-up? The Giant Mushroom in New Super Mario Bros. on Nintendo DS. Q5. Least favourite Power-up? The Double Cheery Power-up on Super Mario 3D World. Q6. Favourite Boss Battle? The final boss in New Super Mario Bros. on Nintendo DS. Q7. Least favourite Boss Battle? Any Boss Battle that includes Kamek. Q8. Mario or Luigi? Mario. Q9. Princess Peach or Princess Daisy? Princess Peach. Q10. Metal Mario or Rabbid Mario? Rabbid Mario. Q11. Frog Suit or Racoon Suit? Racoon Suit. Q12. Goombas or Koopa Troopers? Goombas. Q13. Super Mario Odyssey, physical or digital purchase? Physical. Q14. Playing Mario alone, or with a friend? Alone. Q15. Super Mario 64 and Super Mario Sunshine, or Super Mario Galaxy 1 and 2? Super Mario 64 and Super Mario Sunshine. What does Mario and his associated franchise mean to you? The Mario franchise as a whole has some great games! Mario isn’t just a plumber but a racing driver, sport star and the mushroom kingdoms favourite hero (Sorry Luigi)! For all these reasons is why Mario is successful and is as known as he is today. Nintendo don’t limit him to just platformers but take risks like the recent crossover with the Rabbids. But to me Mario is my favourite gaming character as all his games are phenomenal. What is a Mario moment you will always treasure? Playing the DS version of New Super Mario Bros. and defeating the final boss. This was really enjoyable as I loved that game and know the game like the back of my hand. What are you most looking forwards to doing in Super Mario Odyssey? Mario Odyssey’s release is approaching fast and I’m waiting patiently but there’s one question on my mind and I need an answer for it. “Why is there a realistic looking Dinosaur in Mario Odyssey?” The only conclusion I have come to is that it must be Yoshi! I’m sure I’ll find out soon but I just found it very strange when I first saw it and still do now. 1) Comment any answer to any question you want in the comments. 2) Answer them all and send us an email with your answers to miketendo64@gmail.com! Stay tuned for more because tomorrow, we have another 2 lined with more to follow as the week goes on! Aren’t you lucky!